Spring is the perfect time to Get Fit and at VetShopAustralia we are also offering you the chance to WIN! 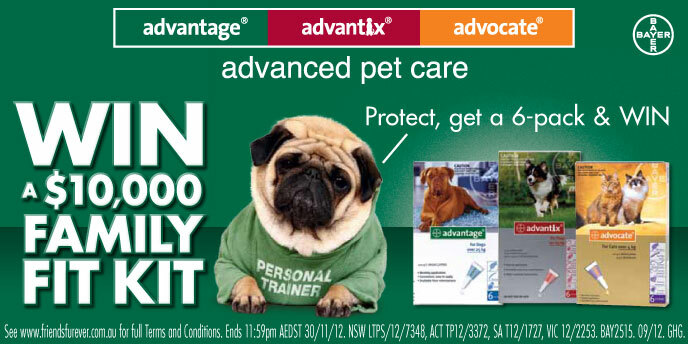 Get a 6-pack when you purchase Advantage, Advantix or Advocate from VetShopAustralia.com.au; to offer your pet the best protection and become eligible to enter the Get Fit draw. 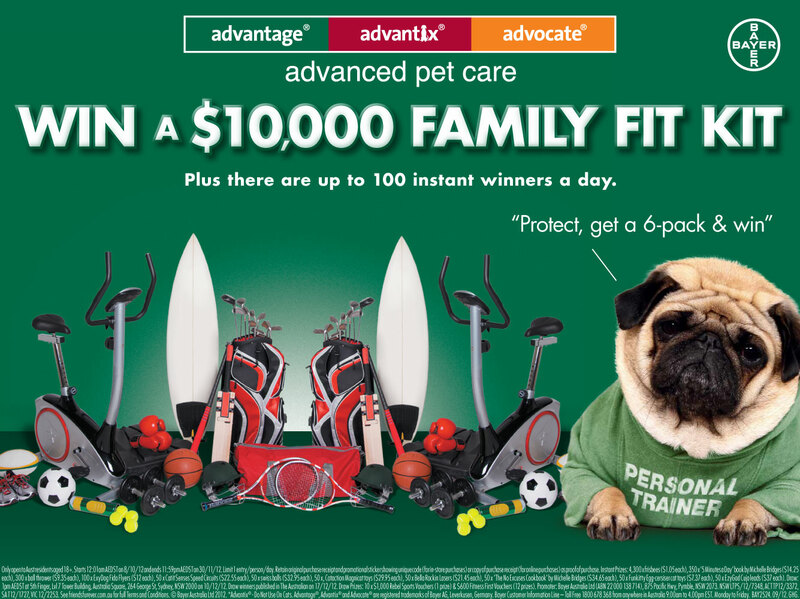 You could win the grand prize - a Family Fit Kit worth $10,000 to enjoy with the entire family, including your furry friend. Another 12 winners will each receive a $600 Fitness First voucher. Plus, there’s even more prizes to be won. By returning to friendsfurever.com.au, you can check if you’re one lucky winner out of up to 100 Instant Prize Winners per day! To participate, simply purchase any 6-pack of Advantage, Advantix or Advocate and mention VetShopAustralia when you enter the draw online at friendsfurever.com.au. Ensure you keep your VetShopAustralia receipt handy to claim your prize. Get a 6-pack from VetShopAustralia.com.au today - because this offer is only available until November 30, 2012! Please note: Draw only open to Australian residents aged 18+. Frontline Plus 12 for 10 Sale! Family Entertainment Prize Winners Announced!